Brent's Travels: Where Did The Beach Go? 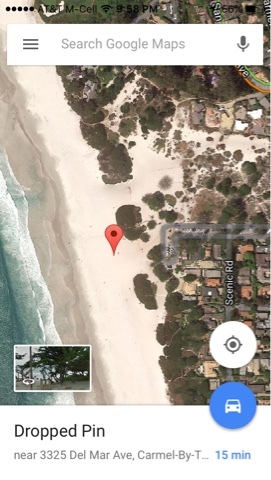 After the visit to Fort Ord State Park Beach where Acer was with his flying machine (see blog on Acer with his flying machine), it was a woman at Point Sur that said to check out The Carmel By The Sea Beach, meaning the beach was also missing. Friday was the destination of the day to check out the beach. Friday also had high surf warnings so the waves should be large. As you can see it was a foggy misty day and in the picture above at the end of Ocean Ave indeed the beach is missing. 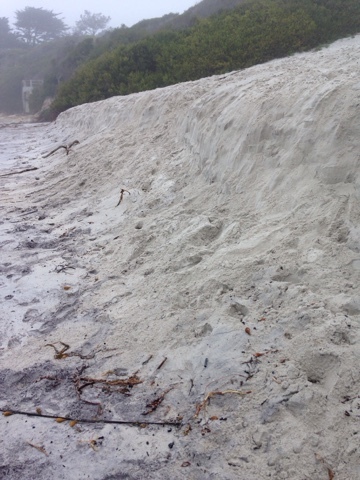 The sand comes down the steep slope and Ryen there is no beach sand in the tidal area. Taking the picture at the high water mark you can see the sand on the right ends and there is no beach. A closer picture here shows a 4-5 foot drop with no beach sand at tidal level. 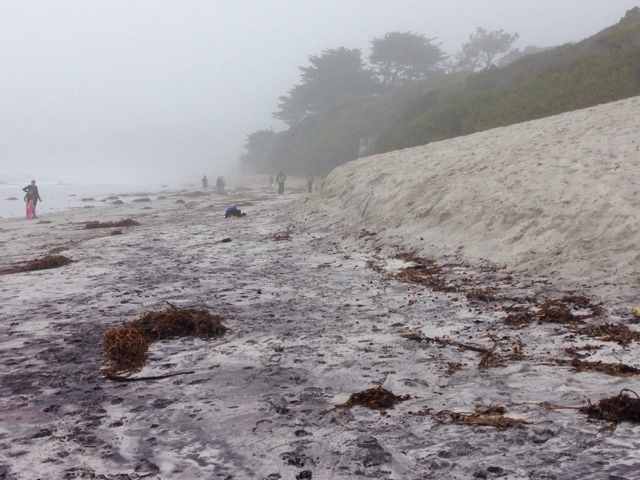 So sand is missing at Fort Ord Beach in Monterey Bay and also missing here. At the overlooking boardwalk at Carmel Beach at the bottom of Ocean Ave. Is this sign with the answer. 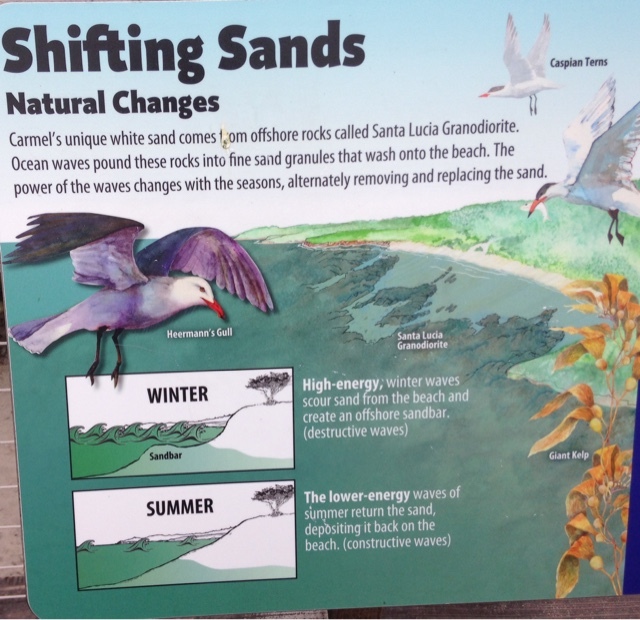 This detailed insert of the sign above shows summer conditions with the sand and beach there. The winter insert picture shows the sand removed at the beach and moved out to a sandbar just out from shore. I live on Massachusetts and shifting sands is not uncommon on the east coast, but I was unaware of the dramatic aspect of the amount of changes that actually occur. As I learned at Point Sur (see separate post on Point Sur) the sand also is dragged down the coast and the coastline is changed by the shifting sands. 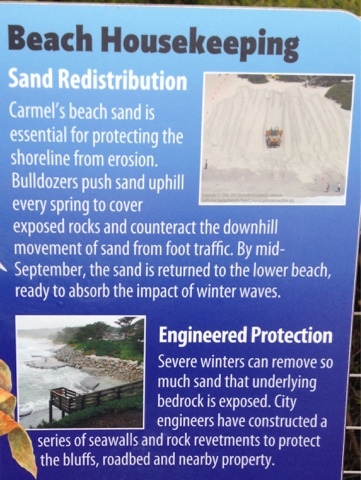 This is how the sand at the Carmel Beach is controlled and restored. 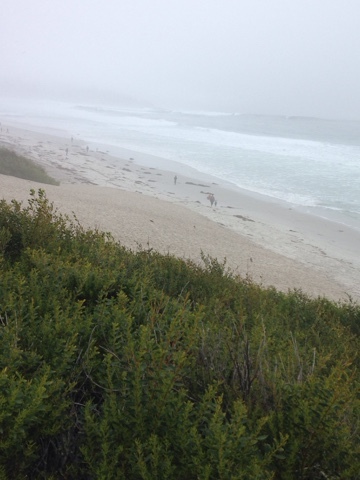 Thousands of people visit Carmel By The Sea each year from all over the world and bulldozers push the sand back to the beach every spring. 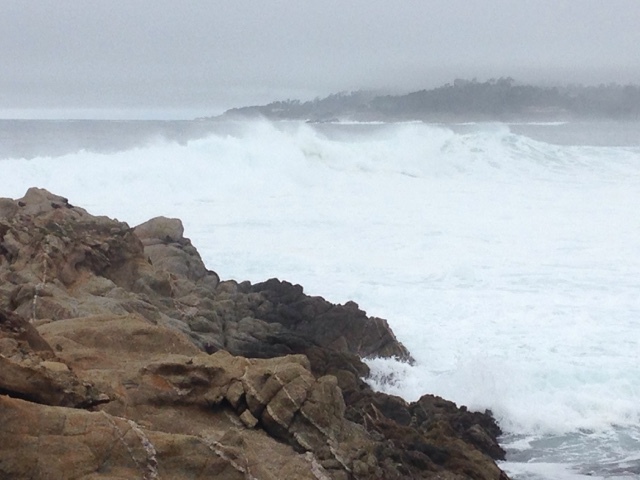 Here is a picture of the Carmel coast high surf due to weather. 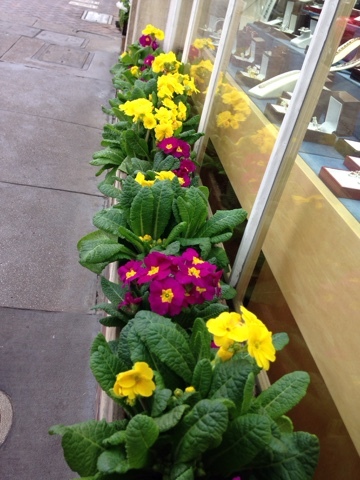 Downtown Carmel By The Sea always has flowers to greet visitors. A trip to Carmel is always an opportunity to do window shopping at relatively hi priced shops and have lunch at one of the many excellent restaurants. 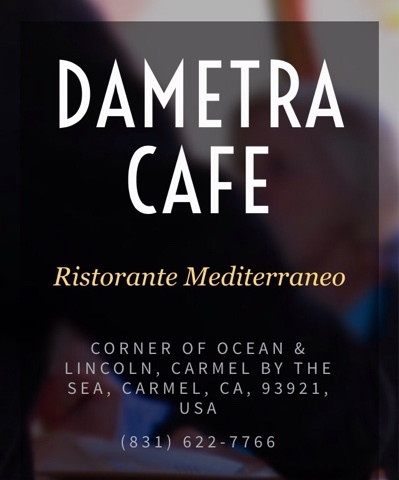 The choice of restaurants today is the Dametra Cafe just up from the beach on Ocean Ave. I chose the gyro for lunch and the food was as excellent as the service. Well worth checking out if you are in the area.